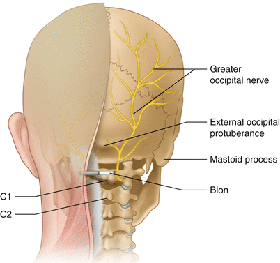 Some headaches occur from stimulation of the greater and/or lesser occipital nerves, either directly or secondary to pathology in the upper cervical spine. If occipital nerve mediated pain is diagnosed by precision injection techniques, then the electrical stimulation of these nerves may provide a long-term non-pharmacologic approach to pain treatment. Peripheral Nerve Stimulation is a minimally invasive surgery that places a small electrical device right next to one of the peripheral nerves. The placed electrode delivers rapid electrical pulses which feel like mild tingles. There is a trial period to measure the success of the procedure. If successful, the device (small generator) is implanted into the patient’s body. Just like a pacemakers, electricity is delivered from the generator to the nerve(s) through one or several electrodes. After completion of the procedure, the patient will be able to control the level of stimulation by turning the device on and off and/or by adjusting the stimulation parameters as needed.